GINA OCHSNER is the author of two collections of short stories, People I Wanted to Be and The Necessary Grace to Fall, both of which won the Oregon Book Award. 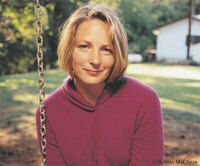 Her work has appeared in The New Yorker, The Best American Nonrequired Reading, Glimmer Train, and others. She is a recipient of the Flannery OConnor Award, the Ruth Hindman Foundation Prize, Guggenheim and NEA Grants, and the Raymond Carver Prize. She lives in Oregon. " To ask Gina Ochsner questions, please sign up. The Hidden Letters of Velta B.
Gina Ochsner hasn't written any blog posts yet. We’d love your help. Let us know what’s wrong with this preview of A Time for Everything by Karl Ove Knausgård. We’d love your help. Let us know what’s wrong with this preview of The Collected Tales of Nikolai Gogol by Nikolai Gogol. Thanks, Don! I'll check out your work tonight! Thanks for the friend request. I'd be honored if you'd check out my work at My Website. You can download any or all of my ebooks for free.